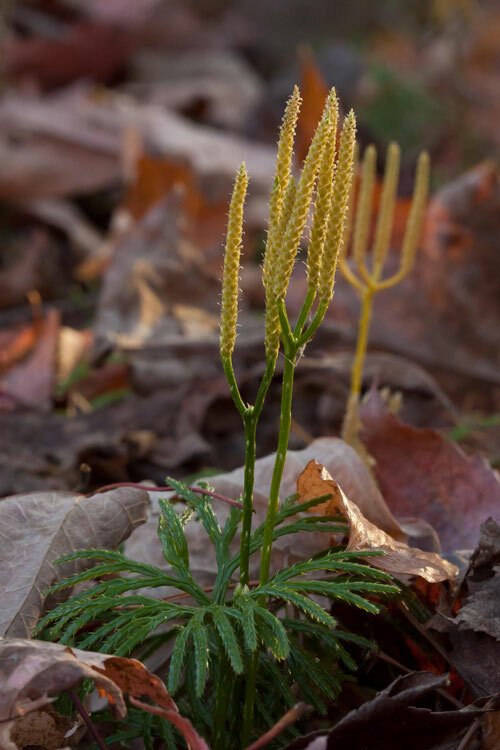 Diphasiastrum digitatum is a perennial evergreen clubmoss to 30 cm tall, colonial from stems running along the ground or just below the, soil surface, rooting at nodes, leafy stems erect, rather yellow-green, branches flattened, 0.2-0.3 cm wide, fan-shaped. Diphasiastrum digitatum branches. Bob Klips. Bobs Brain on Botany 10/2010. bobklips.com (Accessed 11/2017). 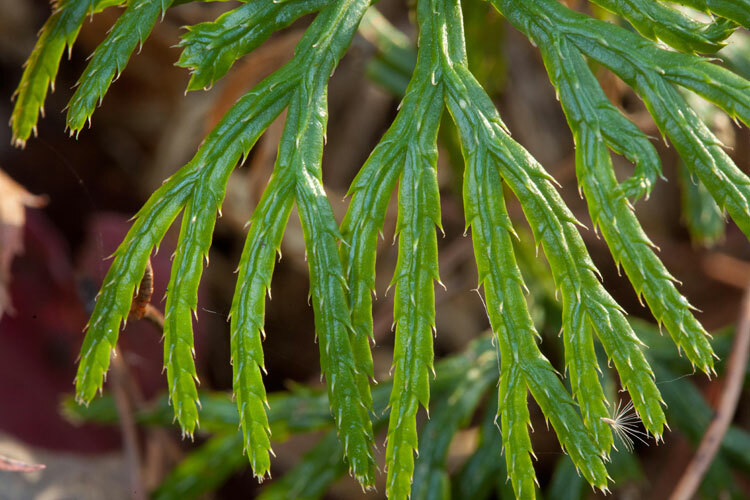 Leaves tiny, scale-like, flat, in 4-ranks, tips sharply pointed, bases broad and fused to branch surface, tips pointed outward. Diphasiastrum digitatum (Lycopodium d.) plant with spore cones. Bob Klips. Bob’s Brain on Botany. bobklips.com (Accessed 11/2017). Spore cones yellow, 2-4 (or more) cm long, 0.5 cm wide, 1-4 or more in a candelabra arrangement above green branches. Habitat: Dry, sterile soil in undisturbed open woods or burned or cut-over areas. 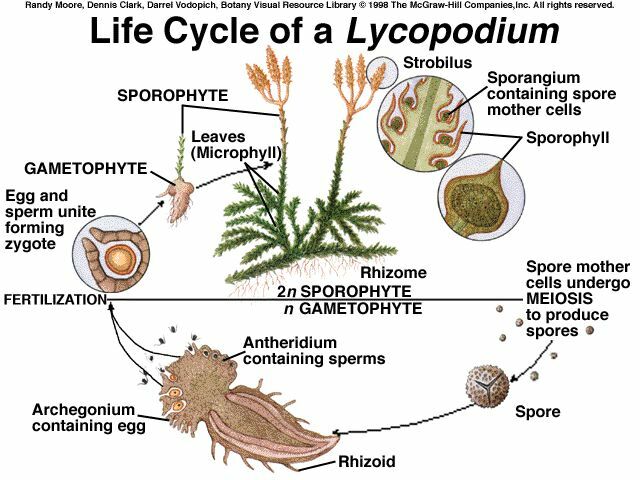 Lycopodiaceae life cycle. DoralBio5 Club Mosses. Creative Commons Attribution Share-Alike 3.0 License. doralbio5.wikispaces.com (Accessed 11/2017). Notes: Plants in the family Lycopodiaceae cannot be successfully transplanted or propagated for restoration to natural areas. 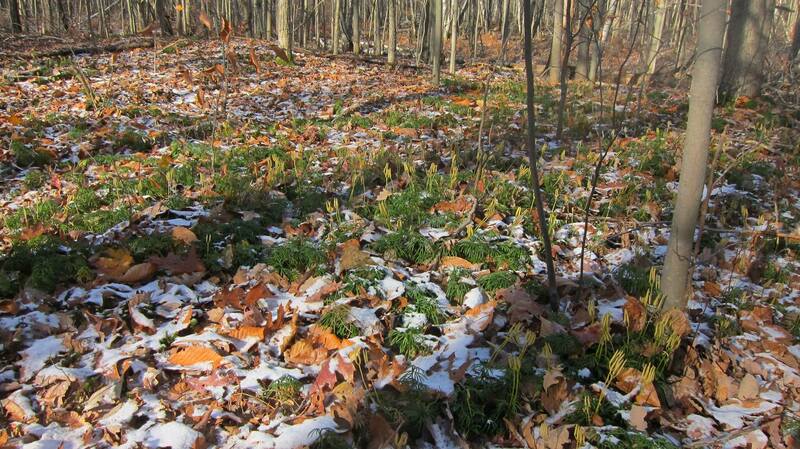 Habitat protection is the only means of conserving these plants. They have a two stage life cycle and are usually dependent upon specialized symbiotic, mycorrhizal fungi during the subterranean gametophyte stage (Raven et al. 1986). Colonies of 250 m across, aged at 830 years old, were measured in Finland (Montgomery and Fairbrothers 1992). The family Lycopodiaceae arose in the early Devonian Period, 405-345 million years ago (Wagner and Smith 2007).